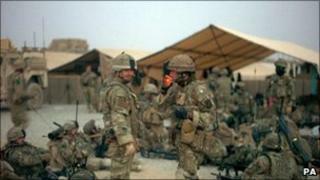 Six US soldiers have been killed in an attack near Kandahar in southern Afghanistan, military sources say. The Nato-led International Security Assistance Force (Isaf) did not give the nationalities of the dead. Two Afghan soldiers were also killed. A senior Afghan army officer told the BBC a suicide car bomber had targeted a checkpoint outside a base manned by Afghan and US troops in Zhari district. It is at the heart of a months-long Nato offensive against the Taliban. Fighting has intensified in the south of the country as US troops have tried to push Taliban militants out of their strongholds in Helmand and Kandahar provinces. A small van packed with explosives blew up at the entrance to the US base. American commanders there are confident that they have been making progress in and around Kandahar, says the BBC's Paul Wood in southern Afghanistan, but clearly the Taliban are still present in the area. None of the US officers to whom our correspondent has spoken are under any illusion that the Taliban can be completely defeated. But they do hope to weaken the insurgency sufficiently that the Afghan forces will be able to deal with the Taliban on their own once the US troops start to withdraw next year, adds our correspondent. The death toll from Sunday's attack is the highest from a single incident for foreign soldiers in Afghanistan since six were shot dead by a renegade border policeman on 29 November. Nearly 700 international soldiers have been killed in Afghanistan so far this year, well above the 520 killed in the whole of 2009.